New Traffic light is front page news in your community paper. Note it said light and not lights. Yes, only one traffic light. The meat market really is a meat market. Before we moved here different people told us that Dunrobin had a meat market. A place where you can meet interesting people, a place where you can bump into someone you know, and a place where you can pick up what you want when you don't have it at home. At first, I was apprehensive about this place which has a meat market and was concern that everyone was raving about it. I thought it was a some sort of pub. Shows you where my mind was at the time. As it turns out it really is the best meat market for miles, if you eat meat that is. Sammy's Pizza, the owners are two brothers and both are named Sam. (Don't ask!) Nonetheless, they are famous, well sort of, for their rice pudding that is. When I first moved here I asked for a lemon wedge with my glass of water. Sam said, "Sure, but it will take me a moment." Then I saw him run across to the meat market apparently to buy a lemon for my water. Try getting that kind of service in the big city. Anyway, now I drink my water like the locals, sans lemon, because I am a local. There was a gas station. Only in a small town would they take away an essential service and replace it with ahhh, nothing. (See the dirt besides Sammys.) Once I filled up my car with premium gas, and then realized that I left my purse at home. Really. The nice man said, "just make sure you are back before 5 pm when I have to cash out." Can you do that in a city? I think not. You can order the best fluffy pancakes for breakfast at Heart & Soul. And the server knows the person you're with is not your husband, and you arrived in the same car. But does not say anything. I was treating my brother-in-law to breakfast who looks a lot like my husband but older. He looks older not because of a hard life, but because he is older. The waitress was acting so formal whereas normally she is so talkative, so I said, you know this is not Alan, right? She said, oh, I just thought he had a bad night. She is my mother's only sister. She visited a few times, the last time was a couple of years ago. I really enjoy her company, especially with all the baking (she did all the baking),and our long walks in the woods. This is a short video on her concerns about the future. I wish she would visit again, soon. I love my aunt! If you find yourself near Melbourne, Australia, and you are looking for an interesting place to visit I recommend William Ricketts Sanctuary. On the drive to Mount Dandenong you will drive past Flippin Pancakes. But resist driving directly to Ricketts, and do stop here you'll be glad that you did. Flippin Pancakes is fabulous with an amazing menu and wonderful staff. I decided on pad thai and the spices danced on my tongue in celebration. Do you ever think about what sort of legacy you will leave after you die? How will you be remembered? Personally, it is not something I am preoccupied with thinking about but it is something I am certain we, at some point in our life, contemplate. Specifically, what imprint will our life leave in the world and will anyone remember us 10, 20, 30 or more years from now. How does that make you feel? Is being remembered far into the future about ego? I remember saying to a friend after her dad died that she ought to write his obituary and place it a major newspaper. She asked me why I thought that was important. To which I replied from an historical perspective, if in the future someone were curious about her family it would serve as a good starting place to begin their research. It is a record of when and where he was born, his parents, his children and grandchildren, his accomplishments, and how he died. In the end, I am not sure what she decided. So, for historical reasons you may want to be remembered for your accomplishments and legacy to your decedents. But does this really matter? In my opinion, indeed it does. I just got word that a former colleague recently died. Reading his obituary demonstrates the importance of a good obituary. His obit is filled with so much information. What I remember about him was his absolute love of classical music . RIP Stewart Raby. It occurred to me whilst pondering life, death, remembrance, that the meaning of life is to lived life to the fullest, and to drink greedily from life's fountain of possibilities. Do something that makes a positive difference in your life, and do it often. It does not have to be a grand gesture. For example, do you remember the last time you really had some fun, had a belly laugh, a laughed that made you cry, or was overwhelmed by the beauty of the setting sun? 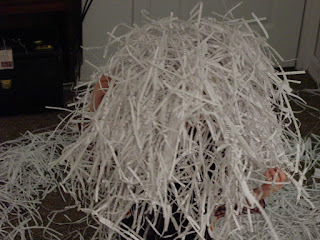 When my son was younger about 3 or 4 years old he would often say “I am so happy, I am going to remember this day forever.” When was the last time you rolled around on the floor with shredded paper, as he is doing in this picture? Think of how amazing your life could be if everyday was a day to be forever remembered! Take notice of your surroundings and appreciate the natural beauty like this lone wolf. I'm on the mend, most of this insidious flu/cold is all but disappeared, only a bit of a cough left. I can't believe that this virus is taking residence in my body for going on the second week. After all I've been only feeding it good old healthy stuff, like drinking ginger tea and eating hot homemade soup. Surely it has enough of the healthy stuff by now and is disparate to leave my body. I feel the warm liquid slide down my throat momentarily coating and soothing it. How many cups of this have I drank in the last week? Too numerous to count. Yesterday, I decided to make some vegetable soup. As I was cutting the vegetables I decided to make it a carrot ginger soup. I do love ginger! Then, I decided to make it hot and added some hot peppers from the garden. My intent was to sweat out the last of the cold virus if possible. Each year there are turtles crossing the road, and each year the traffic gets busier. 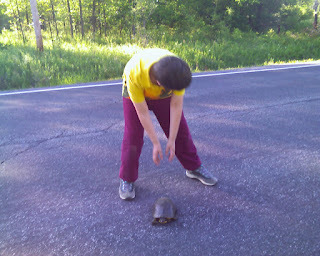 We stop, when it is safe to do so that is, and help the turtles get across the road safely. Take a moment from your busy schedule to help someone.